The breakthrough of Einstein’s General and Special Theories of Relativity give us a much clearer picture of some of the observed and theoretical processes within the Universe. Much of his theories have already been confirmed by observation including the bending of light waves by a massive object. Such proof was witnesses as stars near the Sun were shown to shift positions – observed during a solar eclipse. On a much larger scale, massive objects like black holes and brown dwarfs also bend distant light rays as do galaxies and galaxy clusters. When using massive objects like galaxies and galaxy clusters to examine the bending of these light rays, the gravity of these objects acts like a lens. This effect is called gravitational lensing and has proven very effective in observing some of the most exotic phenomenon such as exoplanets and quasars. Even more remarkable is the use of gravitational lensing to detect and map dark matter regions surrounding galaxies and galaxy clusters. By using a gravity lens, the detection of dark matter has been confirmed and is providing valuable data for cosmologists to help mold the theories involving the constituents and origins of dark matter. The presence of mass within space-time creates a curve (or depression) in the fabric of space-time. The common analogy of this is the rubber sheet. the line of sight to the observer with the massive object in between. 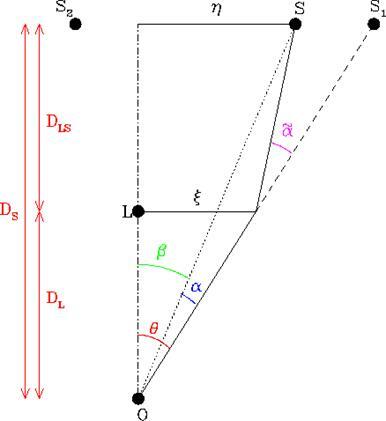 This basic two dimensional lens demonstrates a correlation between length and angles based on the radius of influence by the massive object. Figure 2 is a graphical example of this two dimensional lens. The point L is the massive object while point S1 is the distant object. S is the apparent position of the object to the observer; O. S2 is ignored in this example. This equation (right) demonstrates the basic properties of the lens effect in figure 2 (the following examples: Wambsgauss, 2001). This is an important realization as this gives astronomers a tool for measuring the strength of a gravity lens with the benefit of helping to determine the distance as well. So what would a gravity lens look like for a familiar object? 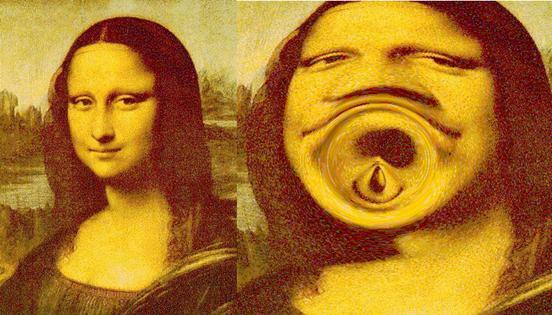 The above image demonstrates what an invisible mass would do if placed between us and the Mona Lisa. The point source is tiny with a mass of the planet Saturn. Notice the obvious circular effect of the lens – the radius. Also notice the tiny nose and the small arc of the mouth within the radius. The overall image is also bloated – spread out as a result of the lensing. 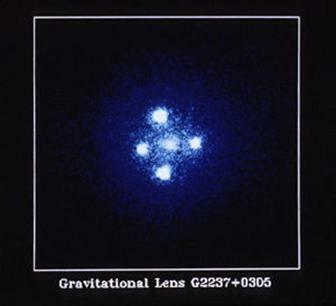 This is a typical effect of the gravity lens. This particular arrangement is called the Einstein Cross. The four points of the cross are a lenses distant quasar, 8 billion light years away. The center if the cross is the lensing body, a galaxy “only” 400 million light years away (http://hubblesite.org/newscenter/newsdesk/archive/releases/1990/20/image/a). Strong lensing is the result of a lensing object splitting the lensed object into separate distinct images – like our Einstein Cross example above. Strong lensing can also produced a large number of arcs as well. 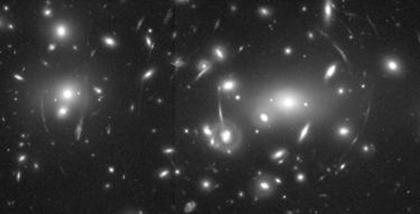 The usual targets for strong lensing are clusters of galaxies. By studying the strength of the lens, the astronomers learn about the mass distribution throughout the cluster. Weak lensing is defined by arcs of the lensed object by a lensing object. 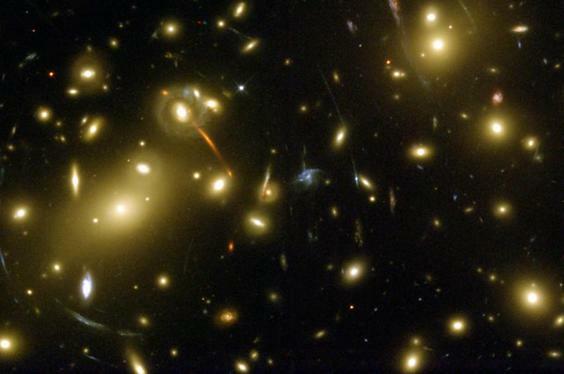 This Hubble Space Telescope image of galaxy cluster Abell 2218 shows an example of weak lensing, the arcs of distant galaxies lensed by the cluster. 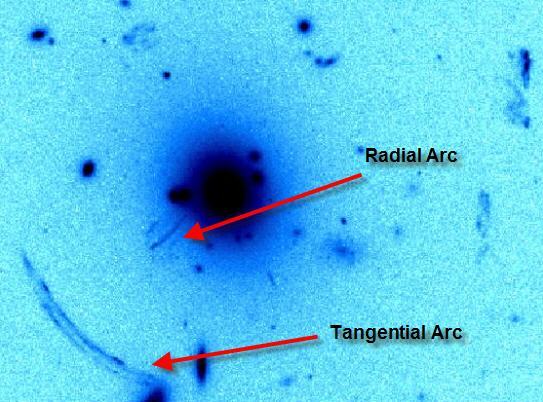 Studying weak gravitational lensing is very useful in the study and detection of dark matter. Microlensing is also a gravity effect, but not as pronounced as strong or weak lensing. In this case, the lensing mass is a MACHO (Massive Compact Halo Object) – black holes, white dwarfs, brown dwarfs. The result of a microlens is a momentary increase in brightness of a distant object. A type of baryonic dark matter (although only a small percentage of dark matter) are MACHO’s, so mapping the distribution of these objects is useful in the study of dark matter (Silk, 1999). 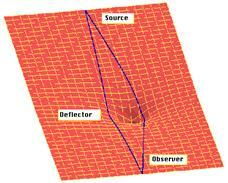 Microlensing has also been effective in the detection of exoplanets as well, but that is another story. This equation may seem rather complicated, but according to Metcalf and Silk, 1999 this equation is used for a point source such as a supernova. The implication is that a mass of an exploding star is known so with the strength of the lensed supernova (granted one is in the right spot), the mass and radius of the lens determines the nature of the lensing material – in the case of Metcalf and Silk, 1999, either MACHO’s and/or interacting elementary particles (possibly neutrinos). all of which to a good approximation. In the case of this specific MACHO survey, the lens is predominantly brown dwarf stars. While technically a MACHO (brown dwarfs reside in the halo and it is a compact object), it is unlikely that brown dwarfs contribute any significant mass to dark matter. The figure above (http://www.llnl.gov/str/June03/Cook.html) demonstrates how a microlens works. It can also create tiny arcs, but more commonly the intensity of the lensed object increases over a short time. Luminosity changed in the point source (like a distant star) can also be used to determine the strength of the lens. This is done by comparing brightness levels before and after the lensing event. A simple method is compare the mass of the actual star, then compare with a mass of a star of equal brightness of the lensed star – that is, the increased brightness compared to an actual star of the same brightness. A second major MACHO microlensing survey was performed, this time acquiring spectroscopic and B-V data on more sources – including binary stars. While the equations and techniques were similar to the first, the benefit of this survey also allowed for the mass of distant stars (if unknown) to be determined based on binary and B-V data (Alcock et al., 2000). Again, the primary lens of this survey is also brown dwarf stars. The weak gravitational lensing is used instead to map the overall distribution of dark matter within the halo of galaxies, or within the spaces between galaxies in a galaxy cluster. The probability of arcs present in any given galaxy or galaxy cluster helps to determine the overall mass of dark matter within the lens as well as constrain the mass density of the Universe (Cooray, 1999). Figure 7: A beautiful example of weak lensing. By using a variety of computer simulations and know CDM variables, it is suggested that lensing of quasars by nearby dark matter filled halos and statistically evaluating the size and number of arcs created by the halo of the quasar will constrain the mass density of the Universe (Li and Ostriker, 2002) which is a recurrent theme of weak gravitational lensing and dark matter. To take this a step further, it is also proposed that the variations in count of radial and tangential arcs will provide a more accurate distribution of dark matter (Oguri et al., 2001). Other observational tests include study of dark matter halos using surveys like the Suprime-Cam 2 Square Degree Field (Miyazaki et al., 2002). With the current observation fitting theoretical models, study of dark matter using weak gravitational lensing is most effective at studying dark matter directly (Waerbeke et al., 2002). By studying weak lensing in a variety of galaxies with ellipticities (elliptical galaxies included) between 0.5 and 3.5, the distribution of dark matter has been shown by observations from the Canada-France-Hawaii Telescope (CFHT) to be correlated (Waerbeke et al., 2002). This helps to solidify our current value of the mass density of the Universe. So what does all this mean exactly? While weak gravitational lensing observations and simulations are valuable for cosmology, it still does not answer the question of what are the constituents of dark matter. Much of the attention in gravitational lensing has been centered on microlensing and weak lensing, but there have been some use of the strong lens in helping to solve the dark matter mystery. By evaluating the strong lensing phenomenon, astronomers can look to the early Universe dominated mostly by quasars. The Cold Dark Matter (CDM) model relies on the gravitational lens data from quasars and the computer models demonstrate that distortions of arcs from distant quasars as well as secondary reflections will help correlate the redshift of a quasar (Matsubara, 2000). Such a correlation was found when the four lensed image (the Einstein Cross) of a quasar was evaluated for statistical variations in the broad-line and narrow-line (BLR, NLR) data; however, these statistical analysis is used primarily for tweaking the CDM model to determine when the galaxy substructure in the early Universe occurred (Metcalf et al., 2004). This correlation of redshift and lensing strength was found just recently so further surveys are needed to collect this valuable data. Since dark matter is a major constituent of matter in the Universe, the detection and measure of dark matter using lensing techniques has proved vital in determining the overall density parameter of our Universe. Such implications can reach deep into the field of cosmology as the density parameter also determines the value of the Hubble constant as well as the overall shape of our Universe. (Li and Ostriker, 2002)(Miyazaki et al., 2002)(Waerbeke et al., 2002). which means if the value of mass density changes, it should not be higher than 0.62. This does not take into account the contribution of dark energy, which is not covered here. The future of gravitational lensing will require additional direct detection of dark matter. One proposed project is the detection of massive compact objects in other galaxies (called MASCO’s). By using yet another variation of the Einstein Radius equation, it is believed that a survey using optical and radio (VLBI) maps of other galactic halo that the distribution of these compact objects will determine the nature of these objects (Inoue and Chiba, 2003). Such a survey could add valuable data to the Cold Dark Matter (CDM) model. Up to date data on the current MACHO projects can be found on The MACHO Project website: http://wwwmacho.anu.edu.au/. Project OGLE (Optical Gravitational Lensing Experiment) is an ongoing project to collect real-time data on MACHO’s near our own galactic center: http://bulge.astro.princeton.edu/~ogle/. While many of these projects are either ongoing or proposed, there is no clear answer as to what dark matter really is; but gravitational lensing is providing most of the much needed valuable data to help solve this puzzle. Alcock, C. et al. “Real-Time Detection and Multisite Observations of Gravitational Microlensing.” The Astrophysical Journal, 463:L67-L70, June 1, 1996. Alcock, C. et al. “Binary Microlensing Events from the Macho Project.” The Astrophysical Journal, 541:270-297, September 20, 2000. Cooray, Asantha. “An Upper Limit on Ωm Using Lensed Arcs.” The Astrophysical Journal, 524:504-509, October 20, 1999. Inoue, Kaiki Taro and Masashi Chiba. “Direct Mapping of Massive Compact Objects in Extragalactic Dark Halos.” The Astrophysical Journal, 591:L83-L86, July 10, 2003. Li, Li-Xin and Jeremiah Ostriker. “Semianalytical Models for Lensing by Dark Halos. I. Splitting Angles.” The Astrophysical Journal, 566:652-666, February 20, 2002. Matsubara, Takahiko. “The Gravitational Lensing in Redshift-Space Correlation Functions of Galaxies and Quasars.” The Astrophysical Journal, 537:L77-L80, July 10, 2000. Metcalf, R. Benton and Joseph Silk. “A Fundamental Test of the Nature of Dark Matter.” The Astrophysical Journal, 519:L1-L4, July 1, 1999. Metcalf, R. Benton, et al. “Spectroscopic Gravitational Lensing and Limits on the Dark Matter Substructure in Q2237+0305.” The Astrophysical Journal, 607:43-59, May 20, 2004. Miyazaki, Satoshi, et al. “Searching for Dark Matter Halos in the Suprime-Cam 2 Square Degree Field.” The Astrophysical Journal, 580:L97-L100, December 1, 2002. Oguri, Masamune; Taruya, Atsushi and Yasushi Suto. “Probing the Core Structure of Dark Halos with Tangential and Radial Arc Statistics.” The Astrophysical Journal, 559:572-583, October 1, 2001. Silk, Joseph. A Short History of the Universe. Scientific American Library, New York. 1999. Turner, Edwin and Masayuki Umemura. “Very Strong Microlensing of Distant Luminous Stars by Relic Massive Black Holes.” The Astrophysical Journal, 483:603-607, July 10, 1999. Waerbeke, L. Van, et al. “Detection of Correlated Galaxy Ellipticities from CFHT Data: First Evidence for Gravitational Lensing by Large-Scale Structures.” Astronomy and Astrophysics Pre-Print, April 28, 2002. Wambsgauss, Joachim. “Gravitational Lensing in Astronomy.” Living Reviews in Relativity, Internet: http://relativity.livingreviews.org/Articles/lrr-1998-12/. 2001. Zhang, Tong-Jie. “Gravitational Lensing by Dark Matter Halos with Nonuniversal Density Profiles.” The Astrophysical Journal, 602:L5-L8, February 10, 2004.